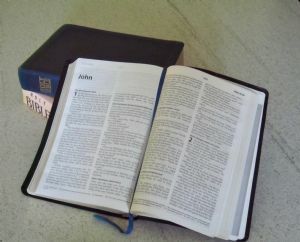 The Bible is God’s Word for us today, His way of communicating with us. We can trust it and it is our guide for all of faith and daily life. God is three persons: Father, Son and Holy Spirit. God created everything and it was all very good, but humankind rebelled against God and rejected Him. Although we should be judged for our rejection and sin, God still loves us. He loves us so much that his own Son, Jesus Christ, died on the cross in our place, paying the price for our sins. Jesus Christ rose from the dead and reigns with God the father in Heaven for all time. He will return to judge everyone who has continued to reject him, but to share eternal life with everyone who has believed and trusted in him. God the Holy Spirit shows us our need to be forgiven and encourages and strengthens us in faith and daily living. Our church is not in a denomination but we are very happy to have fellowship and work together with other believers and churches who have a similar Bible basis. We are a member of the Fellowship of Independent Evangelical Churches and agree with their statement of faith.